No strangers to Music City (in the past two years alone they headlined The Ryman three times, played Live on the Green, opened for Kings of Leon at First Tennessee Park, and hosted a special record release show at The Basement East), Los Angeles folk rockers Dawes are continuing their rapid ascent, extending their prolific tour schedule into the new year in support of surprisingly poppy and experimental 2018 effort Passwords. One of the few major acts who managed to play Pilgrimage Fest before it got rained out last fall (making them the inadvertent headliners of the weekend), the band are once again set to play a two-night residency at The Ryman Auditorium, as they have in the past, this Saturday and Sunday, Feb. 9 & 10. Still billed as part of the “an evening with Dawes” run that’s been going on for a couple years, each super-sized show will feature two sets of songs new and old, and with Dawes’ reputation for their captivating, engaging live presence, they’re sure to be a one of the most memorable performances of the year. A few tickets to both performances are available now here (2/9) and here (2/10) while they last, and we urge you not to wait, so secure your spot then read on for more about the show! Born out of the ashes of Los Angeles indie/post-punk outfit Simon Dawes, Dawes have managed a quick and well-deserved ascent in just under a decade. Made up of brothers Taylor and Griffin Goldsmith, and rounded out by Wylie Gelber and Lee Pardini, the group’s rootsy, folk-rock aesthetic is the product of early jam sessions with the likes of Conor Oberst, Chris Robinson, and Pat Sansone. Influenced by the “Laurel Canyon Sound,” the band have adopted a nostalgic, rock informed flavor of folk, which has nabbed them tours with the likes of Oberst, Mumford & Sons, Shovels and Rope, and M. Ward, and helped them quickly become a festival mainstay, graduating to big stages just a couple years into their career. Dawes have steadily released LPs every year or two since their 2009 debut North Hills, most recently last year’s Passwords, which, as we mentioned above, explores surprisingly poppy new range, and each has been met with critical and commercial success. Known for their engaging, authentic live presentation and nuanced performance style, the band have played the Nashville area numerous times over the years, with The Ryman now established as their regular venue of choice, always giving way to a memorable and transcendent evening. Given their ever-increasing presence, it’s no surprise that the band are once again making this a two-night affair, set to feature “two sets of new songs and fan-favorites” each night, and, while the theme of the tour might seem like deja vu, we wouldn’t necessarily bet on a third evening with Dawes stint in the near future. They’re one of the best live acts making music today, and whether you’re a newcomer or seasoned fan, we urge you not miss out on a chance to see Dawes in action! 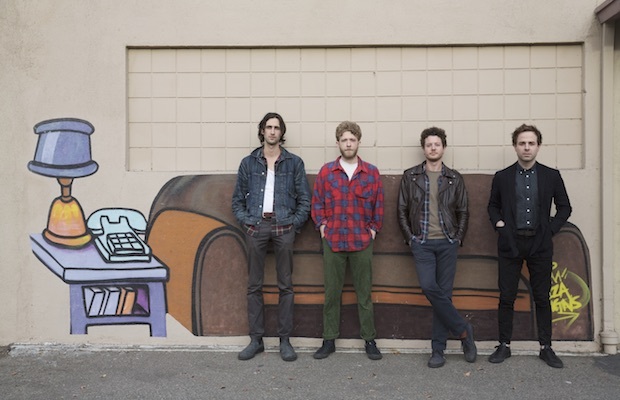 Dawes will perform Saturday, Feb. 9 and Sunday, Feb. 10 at The Ryman Auditorium. The shows are all ages, begin at 8 p.m., and tickets are available to purchase for $39.50 here (2/9) and here (2/10). Enter To Win Tickets To The Inaugural 2015 Pilgrimage Festival!